At Eco Garden Maintenance we believe that the addition of organic matter is the kindest thing you can do for your soil, plants and wildlife in your garden. It really is the most effective way to improve all manner of things and is an essential constituent of healthy, fertile soil. It is being continuously depleted by soil living creatures and organisms, cultivation speeds up it's decomposition and replacement supplies are usually removed by gardeners which, in the wild would go back into the soil. It is therefore essential that adequate quantities of organic matter are regularly added to you garden in order for it to flourish. Many people fail to recognise organic matter's importance in the health of their garden and instead opt to apply a quick fix of synthetic fertiliser which is seen by many as the answer to all their problems. Nothing could be further from the truth as the only thing that synthetic fertiliser provides is the major minerals needed for plant growth. It provides non of the other benefits which organic matter can bring and has actually been noted to harm soil life which results in your garden becoming a junkie, reliant on the next fix. Bulky organic materials need to be composted before use to make them easier to handle, stabilize the nutrients they contain, reduce toxins, kill off any weed seeds present and make them more attractive. Animal manures should never be added fresh because they contain freely available nitrogen compounds which can scorch plants. The bacteria in the soil need huge amounts of water to process this nitrogen and so the water is taken from the soil leading to the scorch effect. In well rotted manures and composts these compounds are stabilized and the material is safe to use. This is the traditional material used to maintain and improve soil fertility. It consists of straw or other bedding material, mixed with animal faeces and urine. Much of the goodness is in the urine and it provides the full range of nutrients needed for plant growth, in a slow release form. About half of the manure is utilised in the first growing season, the other half survives for another year and half of that goes on to a third season and so on. FYM is also highly valued for its ability to provide the organic matter and humus needed for maintaining or improving soil structure, retaining moisture and reducing compaction. It must be worked into soils if possible, when conditions are favourable for its continued decomposition. This is usually nutrient rich material depending on what was used to make it. 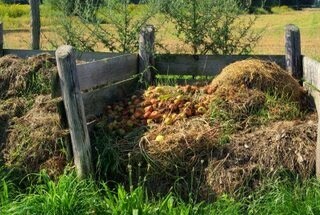 Compost contains all the nutrients needed for plant growth and so is widely used to maintain and improve soil fertility. 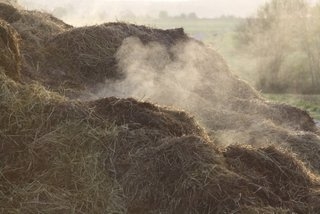 As with manure, it improves soil structure, retains moisture and reduces compaction. It is usually of a finer grade than manure so can be applied to lawns as top dressing and the commercially produced compost is ideal for growing plants in pots. The coarser grades are more suited for use on garden beds as a soil improver. Homemade compost is a viable product if produced in the correct way and is an ideal way to process your garden and kitchen waste instead of taking it to the tip or putting in the council green waste bins. Leaf mould is made of rotted leaves of deciduous trees which have been collected after they have fallen in autumn. It is low in nutrients because nitrogen and phosphate are withdrawn from the leaves by the tree before they fall and potassium is easily leached from the ageing leaf. Leaf mould is however an excellent soil conditioner which can be used anywhere in the garden and can help with moisture retention, weed supression and reducing compaction. Finer grades of leaf mould can be used in homemade potting mixtures and in seedbeds where low levels of nutrients are required. Wood chip applied as a mulch is a widely used product in gardens and other outdoor spaces. It provides little or no nutrients however it does eventually rot down and provide useful organic matter in the form of a soil conditioner. Its main advantages are in the retention of moisture in the soil and its weed suppressing properties. It should not be dug into the soil unless well rotted and of a fine grade. Bark can also be applied as a mulch and is more decorative than wood chip. It also contains little or no nutrients but can be used as a soil conditioner if in a fine, crumbly state. It is effective at conserving moisture in the soil and suppressing weeds. Fine grade shredded bark is also used as a growing media and many plants bought at nurseries will be grown in this with added nutrients. There are other types of organic matter such as coir, seaweed and spent mushroom compost but they are not so widely available. Seaweed is a very useful material as it is high in potassium and trace elements and stimulates bacteria which can help release locked up nutrients in the soil. It is usually found in liquid form and so does not contribute to organic matter levels. Spent mushroom compost is a good source of nutrients and conditions the soil but it is usually of high pH and therefore unsuitable for use on acid loving plants. Organic matter is the best addition to any garden, it is widely available, is good for wildlife and the environment and does not have to travel miles to get to your door. If applied in large enough volumes and often enough, you will never feel the need to buy synthetic fertiliser ever again and reliance on insecticides and fungicides can be greatly reduced.